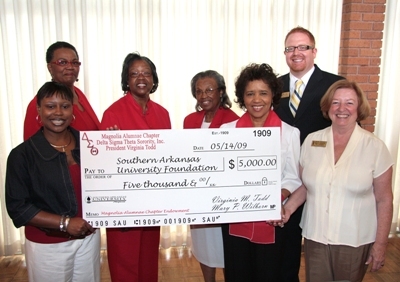 Members of the Magnolia Alumnae Chapter of Delta Sigma Theta Sorority, Inc. present the Southern Arkansas University Foundation with a check for $5,000 to rejuvenate their endowment and add benefits to the current students. The Delta Sigma Theta endowment began in 1977 and was completed at $8,000 in 1987. 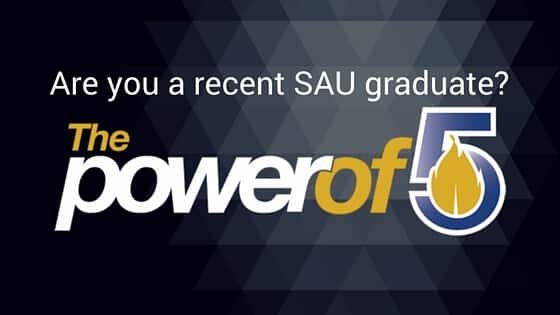 Pictured are, from left, Irs Harris, Cheryl Felder Stuart, Mary Porchia-Wilborn, Dr. Kathleen Mallory and Virginia Todd of Delta Sigma Theta; Josh Kee and Jeanie Bismark of the SAU Foundation.